Check out how many steps you took while walking around with your system and how much time you spent playing games. You can display both types of data by day, week, month or year. Walk more every day to earn Play Coins, which can be used with compatible games and applications like StreetPass Mii Plaza and AR Games to unlock special items or additional content. You can collect up to 10 Play Coins each day, up to a maximum of 300. You can check the number of Play Coins you've collected in the HOME Menu. The Software Library displays a list of all the software you've played. You can also see how often you played and for how long. On the Touch Screen you can scroll through pages with icons displaying your personal software collection. The time you spent playing can be ranked in a variety of charts. Can you spot a new trend in your playing behaviour? You can register up to 256 different software titles in the Activity Log. 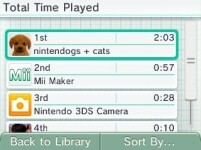 A maximum of seven days' worth of Steps and Play Time data can be recorded while Nintendo DS or Nintendo DSi software titles are left running.